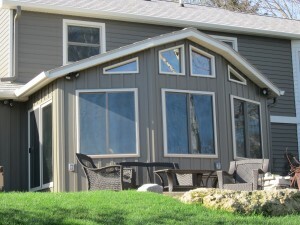 Quality vinyl replacement windows are available to homeowners in Madison, Wisconsin, thanks to ABC Seamless Home Specialists. Our windows can improve the aesthetic appeal and energy efficiency of your home, while adding a protective layer against the elements. With top-notch products installed by our seasoned and highly trained professionals, we have earned a reputation for producing results that leave our clients even happier with their homes than when we started. What we have done for them, we are confident we can do for you. These features help to reduce the amount of work your heating and cooling system needs to do to maintain a comfortable indoor environment for you and your family. That means reduced energy bills, and could result in big savings over the years. For more information about the many benefits that our replacement windows can provide for your home in or near Madison, WI, contact ABC Seamless Home Specialists today.